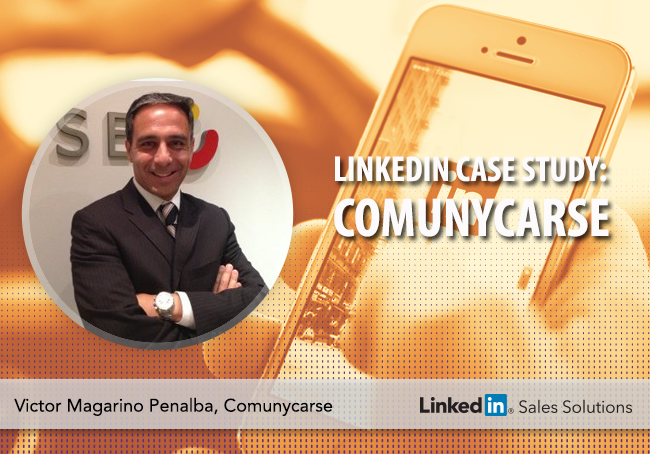 See how Comunycarse leverages LinkedIn Sales Navigator to help increase pipeline and revenue. Our telemarketing team would be taking the lead role with Sales Navigator and some of them weren’t even on LinkedIn so we had to build their profiles from scratch. We sat down together to build out the profiles, for example agreeing on current common titles. They were very much starting from zero in terms of number of contacts, but the experience showed how quickly one can build up a powerful database of contacts on LinkedIn. Telemarketing and sales used to work quite separately and Sales Navigator provided a great way to bring them together around a shared focus. Telemarketing takes the lead on using the tool but we now work as a closely integrated team. Multifunctional teams have informal meetings throughout the week and then a formal planning session on Fridays when goals for the week ahead are discussed, and the sales people are able to give guidance to telemarketing. This is particularly important when it comes to navigating complex organizations which already form part of our customer portfolio. Salespeople are great at providing insight on which key decision-makers and influencers we should be targeting. Our telemarketing and sales teams were incentivized to build powerful, targeted LinkedIn networks that could provide the basis for driving sales leads in the future. Previously, we had only incentivized our telemarketing team on how many meetings they were able to set up, but the dynamics of LinkedIn are different. We then incentivized them to build databases of relevant, quality connections, and started rewarding them for every 50 qualified connections that they made, on top of the meetings they closed. Although we've made effective use of InMail to approach prospects, businesses should never overlook the power of a simple connection request. Our people have been getting a lot of enthusiasm and excellent results just by asking people to become connections. About half of our leads are coming through that process. We’re able to use Navigator to identify the relevant people; when we send them a tailored connection request, it’s a natural next step for them to visit our Company Page and see what we have to offer in there for them. If we did a good research job they are typically interested, so most of the time they accept. Thanks to Sales Navigator, we've been able to add precision to the company’s incentives, using profile data to classify particular contacts as ‘VIPs’ and providing additional incentives for meetings with them. Our telemarketers are loving this new category of incentives. Since we introduced it, we’ve seen a real difference in how the team are living and breathing the task of making VIP connections. The key to maintaining that level of enthusiasm lies in balancing guidelines for effective use of Sales Navigator with space for sales and marketing to use their own initiative. We set guidelines for the key specific messages we wanted to deliver to different groups, but we then leave space to be creative in how our team get those messages across. Initially we created several InMail templates for people to use, but as we’ve moved forward we’ve seen a growing appetite for marketers to personalize their InMails and tailor them to each contact. This seems to be working wonderfully so we continue to leave some room for creativity. Read the full whitepaper to see how Comunycarse is building a new sales and marketing culture around social selling.